Carter posted the flyer promoting his and Da Silva's services from his Twitter page on June 17. Two Virginia Commonwealth University students have begun a “public garage” service, providing free auto repairs from oil changes to brake light replacements. The gesture came as a result of the pair wanting to aid underprivileged Richmonders who may not be able to afford commercial service fees associated with typical fixes that, if neglected, could cause unnecessary damage to their vehicles or invite contact with law enforcement. 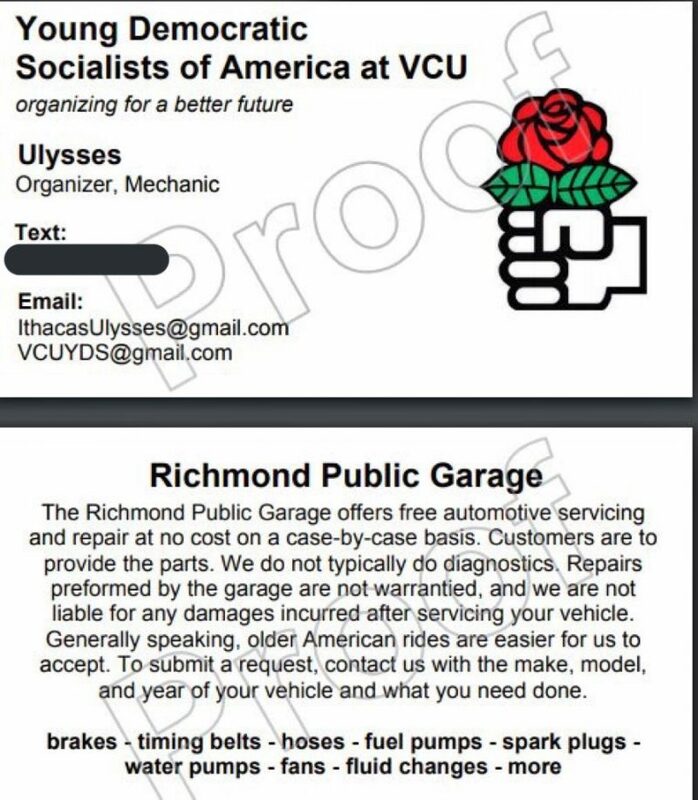 Co-chairs of the VCU chapter of Young Democratic Socialists of America Nicholas Da Silva, 20, and Ulysses Carter, 19, announced their Richmond Public Garage program through Carter’s Twitter account on June 17. Carter posted this flyer promoting his and Da Silva’s services from his Twitter profile on June 17. According to the flyer in the tweet, services include timing belt, hoses and spark plug changes or repairs. Replacement parts may need to be provided by the person in need of service, unless Da Silva and Carter can find the parts themselves. Carter, 19, said he took inspiration from the Black Panther Party’s survival programs — community initiatives implemented between the 1960s and 1980s that provided minority populations with no-cost services such as dental, ambulatory and child care, clothing and meals. The Richmond, Virginia Democratic Socialists of America (DSA RVA), who Da Silva and Carter work closely with, held a campaign to repair Richmonders’ brake lights in January. The GoFundMe associated with the campaign raised over $100 for a clinic to provide those in need with replacement brake lights. Although Carter and Da Silva certified mechanics, Carter said he spent much of his life around cars; he and his father were the handymen of the family. Working with DSA RVA, Carter said they replaced around 30 brake lights. He said the clinic was his inspiration to begin a more all-encompassing, year-round service. Da Silva said they want to be able to apply their democratic socialist beliefs in a way that positively influences Richmonders — not just to feed his ideology. “Obviously, our issues are more idiocentric, but … we’ve tried to be as involved with the community as much as possible,” Da Silva said. “I think we’re doing it cause we both understand how much of a struggle it can be to be out of a car with no easy way to fix it,” he said. Their services are available to anyone in the Richmond metro area. However, Carter said their kindness is not to be taken advantage of by those who are not necessarily strapped for cash. Da Silva said he and Carter will try to service vehicles at their own homes on a case-by-case basis. If the vehicles are unmovable, he said they will consider making house calls. The pair are currently processing their first few customers’ requests and accepting inquiries at VCUYDS@gmail.com. Those sending requests are asked to provide the make, year and model of the vehicle along with the type of repair needed.